The federal government hit its statutory borrowing limit last Friday and is predicted to run out of “extraordinary spending measures” by February 27th, putting before Congress yet again the task of raising the debt ceiling. Given the frequency and contentiousness of this issue, it’s natural to wonder: is there a better way? That was the question former CBO director and current Urban Institute Fellow Rudy Penner considered on February 3 in a Bipartisan Policy Center event in which Treasury Secretary Jacob Lew urged Congress to raise the ceiling. Below is a lightly edited transcript of Penner’s comments, in which he articulates his preference for replacing the debt ceiling altogether. I think that the debt limit is a crock, basically. There’s a paradox here, and that is they always say that to be effective in negotiations you’ve got to be willing to shoot the hostages. We’ve never been willing to do that in the 100 years that the debt limit has been in existence. The real place to negotiate over spending and tax matters, including entitlements, is when you’re debating the budget resolution. That’s when we set our targets for spending and revenues. Having a separate debt limit—I don’t think it has served much of a purpose. It certainly hasn’t brought about fundamental reforms in entitlements. One of the biggest things that happened around the debt limit was the Gramm-Rudman-Hollings [Balanced Budget Act of 1985] but that quickly became bipartisan, and once the debate got going, you hardly heard any mention of defaulting on the debt. So in terms of what to do, obviously my first choice is to get rid of the debt limit law altogether. My second choice was alluded to by Secretary Lew: he noted what Senator McConnell did in the past, and Representative Honda has a very similar approach in the House. The basic idea would be that you would give the president discretion to set the debt limit a year in advance; the Congress would be able to disapprove of what the president did, the president could veto that law, and then you would need a supermajority to overturn the veto. My third choice would be to go back to the Gephardt Rule, which worked fairly reasonably in the past, and that is to tie the increase in the debt to the budget resolution that was passed. There is a practical problem with that: if you do that very rigorously, you’ve got to confront the problem that we don’t forecast deficits very well. Indeed, we often make huge mistakes, so to make that rule work practically, I think you would need some flexibility. You’d need a margin of error there. 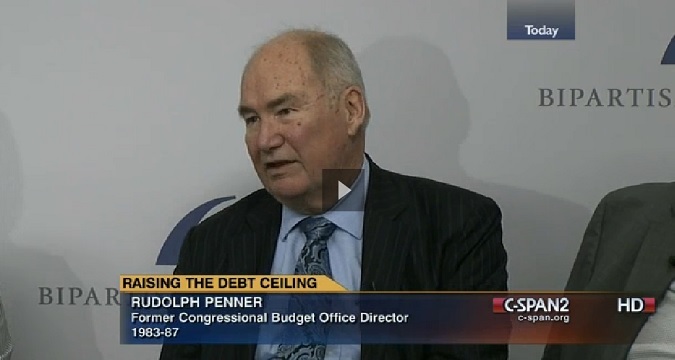 Video clip from C-SPAN coverage of the Bipartisan Policy Center event.